Oh dear. Someone appears to have made something of a mistake here. We appear to have been given a US version of the Wheel Of Fortune game on the Wii. Now, usually this wouldn’t matter, but when we saw it appear on our review list, we were secretly hoping that the John Leslie Mii would make an appearance, perhaps with a few dodge-the-sexual-harassment mini-games on offer. It would also have had the added bonus of re-introducing the gorgeous Jenny Powell into our lives, albeit in Mii form. Sadly, it wasn’t to be, and if you want to play Wheel Of Fortune, you have to play it in American. This raises an issue for us. This is a family title, and while one or two of your family may have a penchant for all things American, the chances are that the understandable (it is primarily for the US market, after all) leaning toward American culture will turn many off to what is, essentially, a very simple, but snazzy, version of Hangman. Past that, there’s not much else to the game. If you’ve seen Wheel Of Fortune in any language, you’ll understand how the concept works. You spin a wheel, land on an amount of cash, then choose letters to solve a word puzzle. The amount you spin relates to how much money you get per letter. Simple stuff, but not entirely unrewarding, given that, unlike many gameshows, it does require a degree of intellect and literacy. The Wii is the best format for this kind of release, and on other consoles it would have received something of a drubbing given the target audience. There’s something undeniably enjoyable about Wheel Of Fortune though, we’re just not sure that it’s exactly what the developers intended. There are a couple of instances where this game will be of use. We suspect it’s aimed at family gatherings, particularly around Christmas, to be used a handful of times and neglected for a year. What we imagine is a better use for it, however, is as a party game with friends. In this instance, it’s enjoyable, inclusive and rarely gets in the way of the drinking, as there’s plenty of down time while other players are spinning and guessing. You can probably play this only marginally longer than you could watch the TV show though, so don’t expect too much longevity. In an effort to give the game a little more than what you’d see on TV, there are a number of mini-games often linked to the actual show. These are a somewhat lazy addition, and simply constitute more of the same. 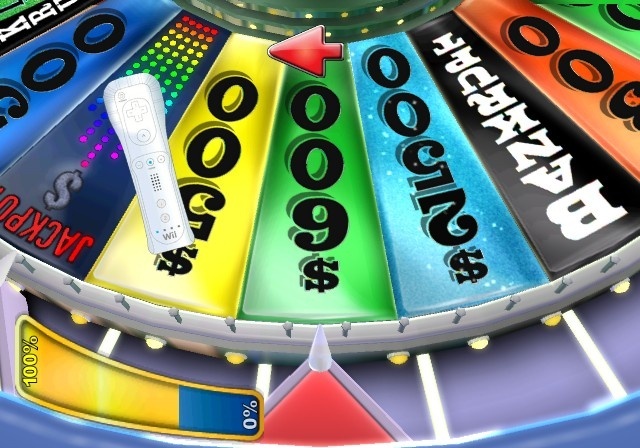 The addition of the US presenters Pat Sajak and Vanna White, and holidays to US locations makes for as authentic an experience as you could wish for on the Wii, even if those characters are neckless freaks. Interestingly, you can use Wii Speak if you happen to have one, rather than the controller for almost any command in the game, as well as choosing letters and solving the puzzles. The main trouble with this is that it simply isn’t accurate enough to not hinder the game in some way. Sometimes mumbling the letters that are already on the board will elicit the right answer, something we found out completely by accident. That said, there’s little point in cheating with such a simple title, and if anything it adds a little more spice to a friendly game. Past that, the controls are straightforward and require little by way of tutorial. If we had one complaint about the control mechanics, it would be that there’s so little to control it highlights the simplicity of the game. Wheel Of Fortune is undoubtedly a fun game, and one that you’ll know whether you want to buy or not. It’s a cheaply thrown together one though, so don’t expect anything spectacular. The mechanics of the game require little past a basic grasp of US culture and English language, but what it does with it is fun. It’s enjoyable in exactly the same way as the gameshow, and for that at least it should be applauded. That said, with only three players, you may be able to find better suited party or family games.